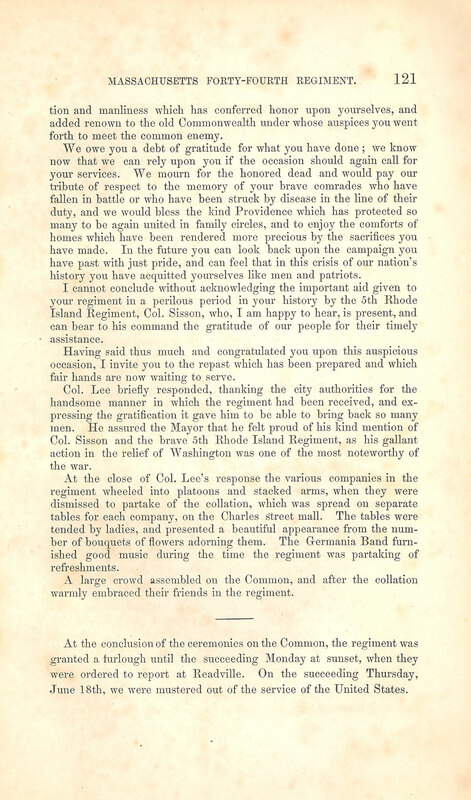 Item description: Excerpt from account written by Corporal Zenas T. Haines (Company D, 44th Massachusetts Infantry Regiment), titled Letters from the Forty-Fourth Regiment M.V.M. 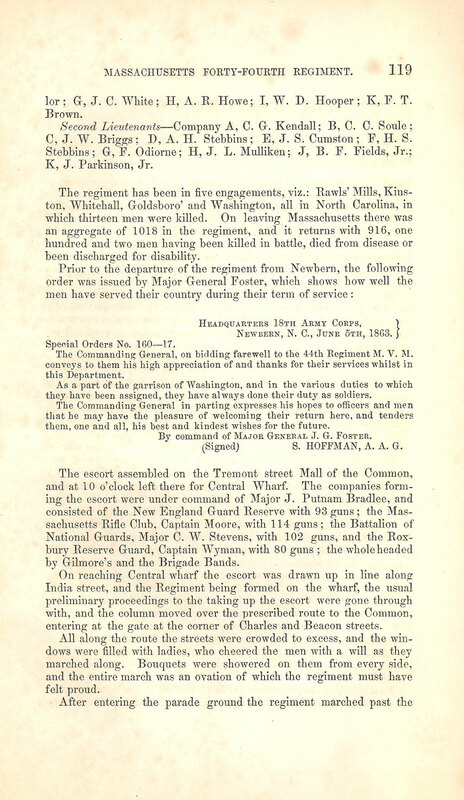 : A Record of the Experience of a Nine Months’ Regiment in the Department of North Carolina in 1862-3 (published in Boston in 1863). 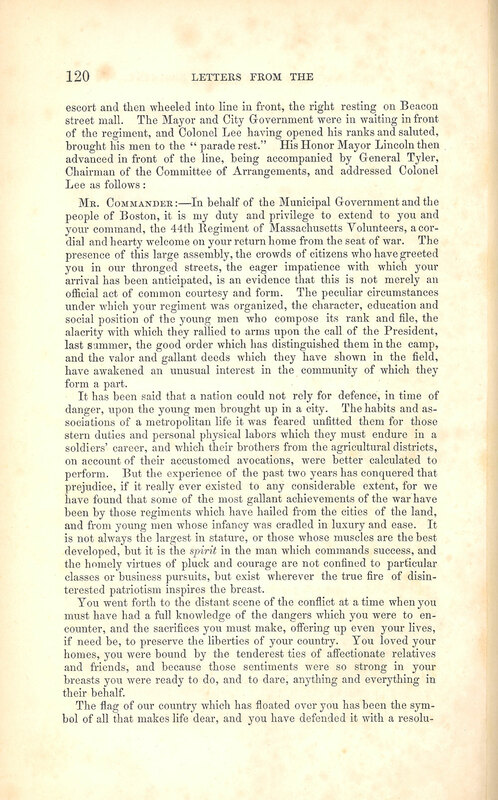 The excerpt contains an article from the Boston Herald, dated 10 June 1863, describing the 44th Massachusetts Regiment’s reception upon returning home to Boston, M.A. 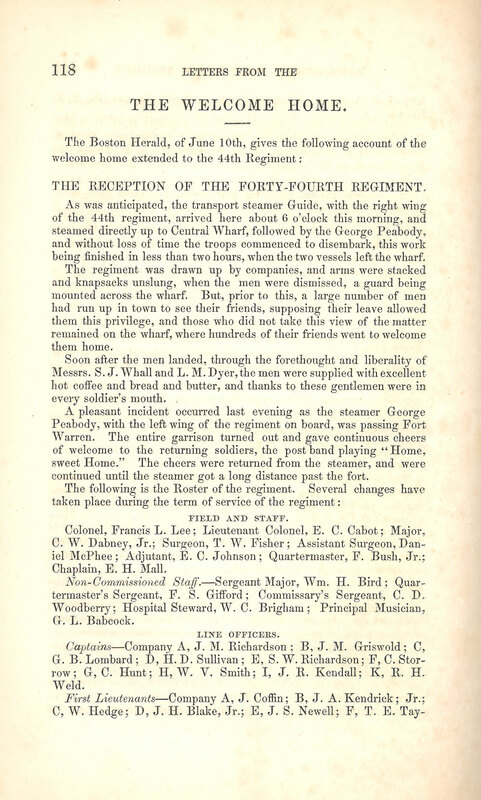 THE RECEPTION OF THE FORTY-FOURTH REGIMENT. being finished in less than two hours, when the two vessels left the wharf. continued until the steamer got a long distance past the fort. termaster’s Sergeant, F. S. Gifford ; Commissary’s Sergeant, C. D.
row; G, C. Hunt; H, W. V. Smith; I, J. K. Kendall; K, R. H.
lor ; G, J. C. White ; H, A. R. Howe; I, W. D. Hooper ; K, F. T.
C,J. W. Briggs; D, A. H. Stebbins; E, J. S. Cumston ; F, H. S.
Newbern, N. C, June 5th, 1863. The Commanding General, on bidding farewell to the 44th Regiment M. V. M.
they have been assigned, they have always done their duty as soldiers. them, one and all, his best and kindest wishes for the future. By command of Major General J. G. Foster. (Signed) S. HOFFMAN, A. A. G.
by Gilmore’s and the Brigade Bands. entering at the gate at the comer of Charles and Beacon streets. terested patriotism inspires the breast. forth to meet the common enemy. history you have acquitted yourselves like men and patriots. fair hands are now waiting to serve. warmly embraced their friends in the regiment. June 18th, we were mustered out of the service of the United States. This entry was posted in Southern Historical Collection and tagged 44th Massachusetts Infantry Regiment, Boston (M.A. ), New Bern (N.C.), Zenas T. Haines. Bookmark the permalink.